Our amazing Silver Magnetic Putty has unique and mind-blowing awesome magnetic properties. 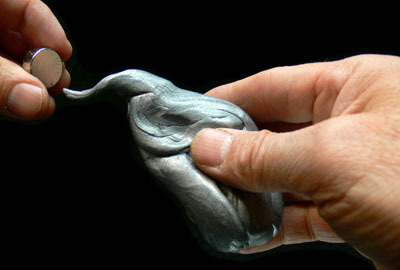 When Magnetic Putty is stretched, molded, or shaped, the putty behaves like any other pliable Putty. However, in the presence of a magnetic field, its magnetic forces begin to align. Suddenly, Magnetic Putty's unique abilities are apparent. Like magnet, Magnetic Putty will attract to one magnetic pole and repel from the other. We include a powerful Neodymium magnet with each tin of putty so you can experiment with this amazing material. Leave the magnet next to it and in a short time, the putty will slowly creep over to the magnet and completely engulf it. Perform endless tricks & experiments - your imagination is the only limit. An interesting thing the Silver version of Magnetic Putty does that the Magenta version doesn't do well is show the magnetic force lines. 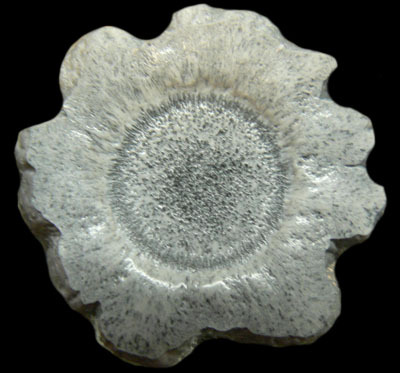 In the image below you can see the pattern produced in the putty with the magnet inside it. 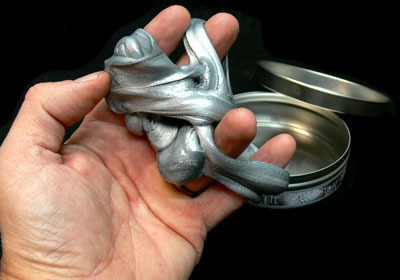 Each metal tin is hand packed with 1/5 lb of of Magnetic Putty, much more than you get in a plastic egg! Putty never dries out, is Non-Toxic, CPSIA compliant, safe for children, and Made in the USA.